The Solomon Islands is a chain of islands located next to Papua New Guinea, and above Australia. It was declared a protectorate of Britain in 1893, based on the brutal labour trade going on from the Solomons to the other islands in the Pacific. The first flag was the British blue ensign. This was defaced with a crown on a white disc, and round the disc, the text "British Solomon Islands." This flag was in use all the way up to 1947. However, the Solomon Islands was the scene for some of the most brutal fighting in the Second World War, with Japan, the US, Britain, and Australia fighting for control. After the war, the Blue ensign was re-introduced, and in use until 1947, when it was replaced with a new ensign, featuring a coat of arms. On the coat of arms was a giant turtle, in black and white, on red. Following the war, the independence movement grew, but never really grew and reached a critical mass. However, independence was achieved in 1978, after being granted self-governance for the 2 years prior to that. 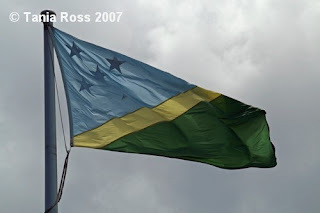 The flag itself was adopted after being granted self-governance, but before independence, in 1977. The flag itself is predominantly blue and green. The 2 colours are divided by a tin band of yellow, running from lower hoist, to upper fly. The blue represents the oceans, the green represents the land, and the yellow represents the sun. In the upper hoist, are 5 5-point stars. Each star represents the main island groups that make up the nation.